Stump Stasis documents a shifting landscape over the course of four years from the perspective of a washed up stump in commencement bay. Now playing in the Tollbooth Gallery, “Stump Stasis” a video by Holly A. Senn (4:43 minutes). “When a huge tree stump washed up on the Tacoma waterfront I became fascinated with both the object and its environment. 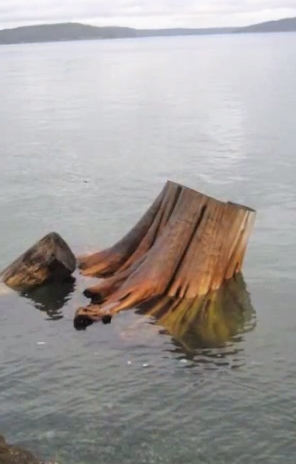 My video Stump Stasis documents the equilibrium of the stump and Commencement Bay over several years—how the stump and the environment change and do not change. This film creates a contemplative space for viewers to consider relationships between forms and landscapes. Holly A. Senn is known for her sculptures and installations created from discarded library books. Her work explores the lifecycle of ideas—how they are generated and dispersed, and whether they are remembered or forgotten. Since 2001 she has lived and worked in Tacoma, WA. Visit www.ryksenn.com to view her artwork. The Tollbooth Gallery is located in front of the Woolworth Building at the intersection of Broadway & 11th. For more information visit spaceworkstacoma.com/projects/tollbooth-gallery.